If you are not an experienced birdwatcher, it can be tricky to glimpse a Brown Thrasher in a tangled mass of shrubbery, here at Songbird Prairie and once you do you may wonder how such a boldly patterned, gangly bird could stay so hidden. Brown Thrashers wear a somewhat severe expression thanks to their heavy, slightly down curved bill and staring yellow eyes. Brown Thrashers are exuberant singers, with one of the largest repertoires of any North American songbird. Brown Thrashers are fairly large, slender songbirds with long proportions—the legs are long and sturdy, and the bill is long and slightly down curved. The tail is long, too, and often cocked upward in the manner of wrens. 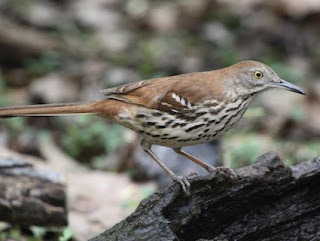 Scrubby fields, dense regenerating woods, and forest edges are the primary habitats of Brown Thrashers. They rarely venture far from thick undergrowth into which they can easily retreat. Come to scout out this amazing bird here at Songbird Prairie.